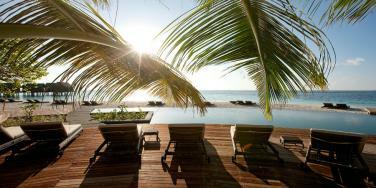 One child stays free of charge in a Beach Villa or Water Villa when sharing with two adults. Two children stay free of charge when sharing a Senior Water Villa with two adults. Valid for stays between 29 April - 30 September 2019. Book at least 45 days prior to arrival to save 40% for stays between 29 April - 26 December 2019, or to save 30% for stays between 4 January - 28 April 2019. For travel between 1 November 2018 - 30 April 2019 guests receive 20% off room rates and meal plan upgrade to half board. Up to 2 children under 12 stay for free on bed and breakfast basis. Up to 2 children under 12 stay free on bed and breakfast basis. Valid on stays between 6 January - 31 October 2019. Save 20% for stays between 29 April - 26 December 2019, or save 15% for stays between 4 January - 28 April 2019. 5 night minimum stay applies, not combinable with other offers. 80% discount for the spouse on an all-inclusive basis for stays between 29 April - 26 December 2019. 60% discount for the spouse on an all-inclusive basis for stays between 4 January - 28 April 2019.